Welcome to the... ahem, penultimate day of #BrightestMay! I was hoping to organize this in such a way as we'd end up with a little bit of "closure"... but, planning ain't exactly my bag. 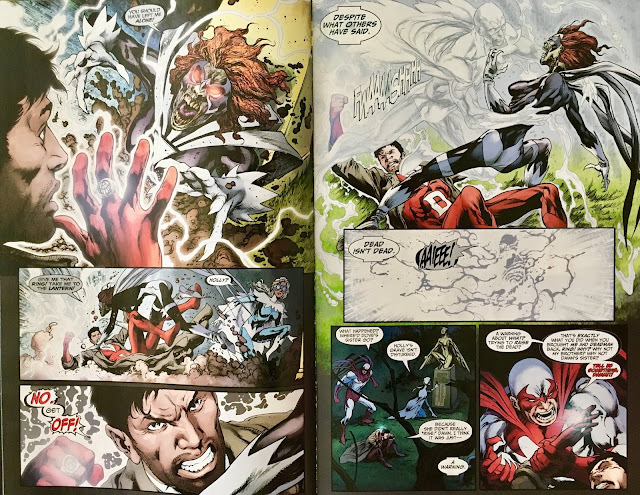 Looks like we'll probably wrap up with "just another issue" from the Brightest Day box! We open in Big Hendy Park in California, where a couple are having a peaceful picnic... sounds like the start of just about every horror movie there is, doesn't it? Well... if you think this scene is about to get dark... you're right! 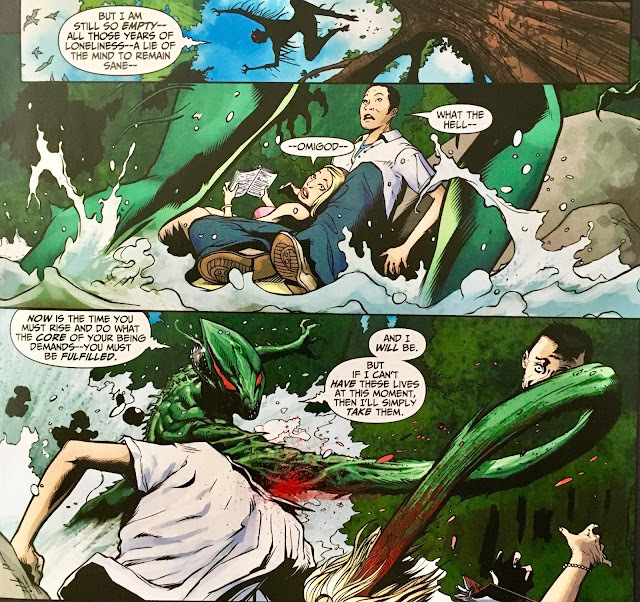 A multi-mouthed martian-ish creature rises from the stream... and kills 'em up real good! 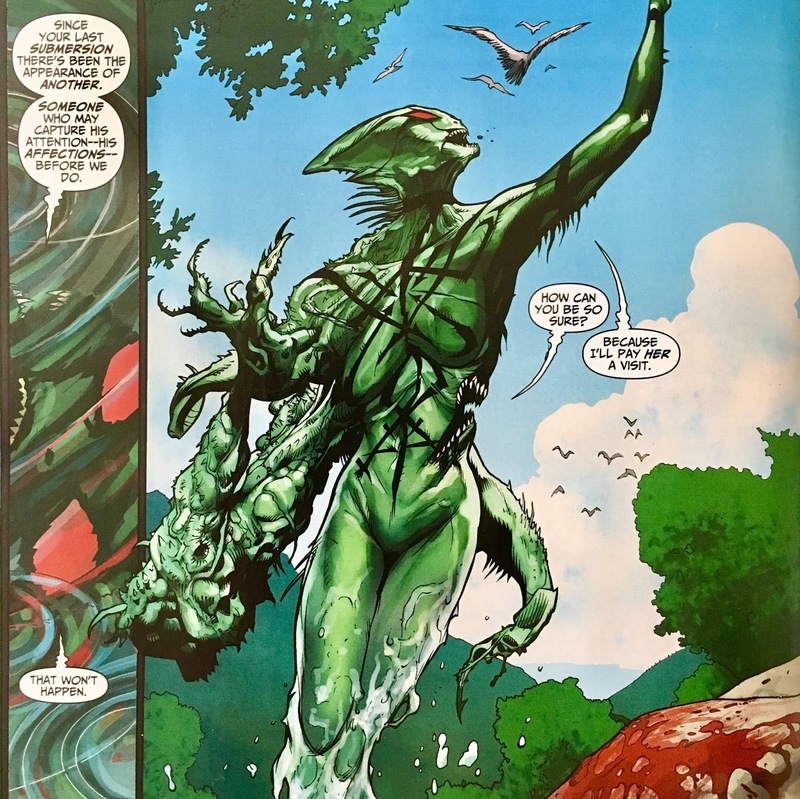 This beastie is looking for J'onn... and has a little chat with itself (multi-mouths, donchaknow) to decide their next stop. Next, we return to Georgetown... where Deadman, Hawk and Dove are... still knelt before the graves of the fallen Don "Dove" Hall and Holly "Hawk" Granger. As Boston tries to raise Holly, the White Ring reminds him that he... er, loved cheeseburgers. Anyhoo, Holly does rise... as a Black Lantern. Before she can do much damage, a glowing white version of Dove (Don) interjects... and in a flash, everything goes back to "normal". After the dust settles, Boston and the birds decide to go out for burgers. It's as though they were bad enough dudes to rescue the President from ninjas. We shift scenes to Pittsburgh University, where Jason Rusch is declining the advances of a pretty young thing who'd really like nothing more than to "study" with him. As he walks by a construction site, a crane's molecular structure changes to that of... bubble gum?! Jason taps into the Firestorm Matrix and rouses Ronnie Raymond from his... er, hangover. Together they manage to save the day... but not without Ronnie puking on one of the construction workers... because, ya know... hangovers. Jason lectures Ronnie on his irresponsibility... which Raymond kinda excuses away, because he's had so much on his mind... including what he did to Gehenna. Jason is surprised to learn that Ronnie remembers... but before they can dig any deeper, they're interrupted by that mysterious third voice in the Matrix. Ruh-roh. 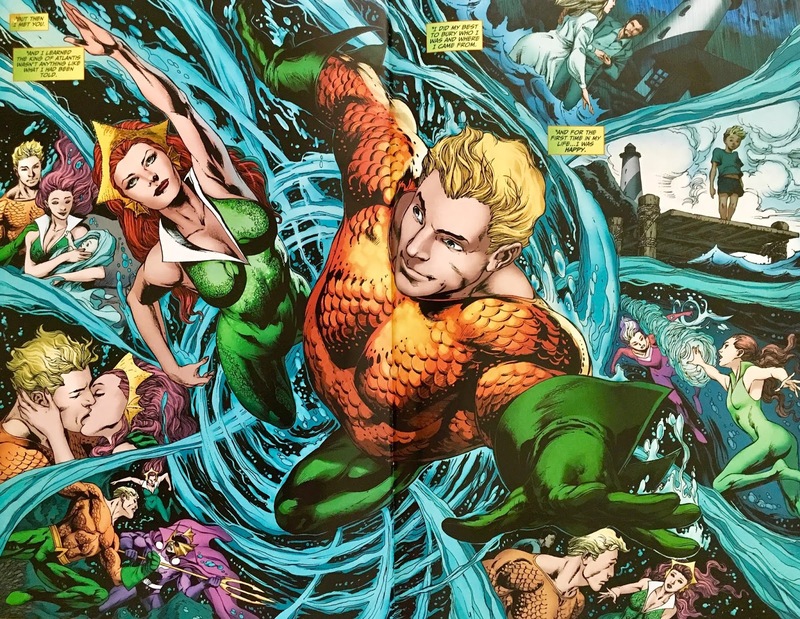 We next rejoin Aquaman and Mera. If you recall, we ended last issue with Mera confessing that she was originally sent to kill Aquaman. Riveting stuff. Turns out, she didn't quite have the stomach for it... and instead, fell in love with Aquaman. It's then confirmed that the mysterious Mera-looking baddie is, in fact, Siren... Mera's sister. After a brief stop at "the Still Zone" to check on his, uh, collection of White Martians... J'onn swings by the Batcave to have a chat with Oracle about the odd and brutal murder we witnessed a few issues back and J'onn used doggie-vision to "witness" an issue after that. Babs tells J'onn that these are the kind of killings that scare the Feds so much that they often "bury" them... covering them up as accidents. 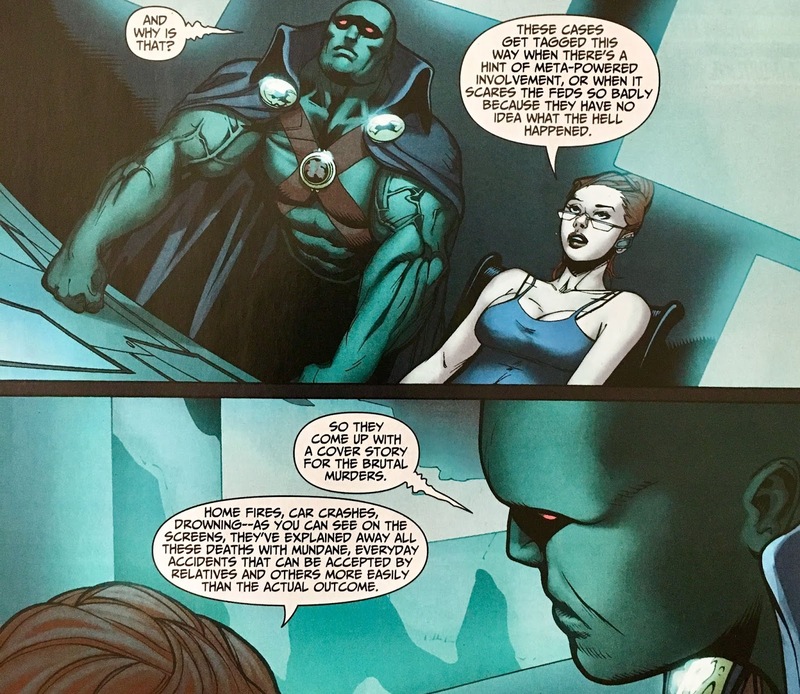 Suddenly, J'onn is struck by a familiarity about the case... and asks Oracle to patch him over to the... Teen Titans?! 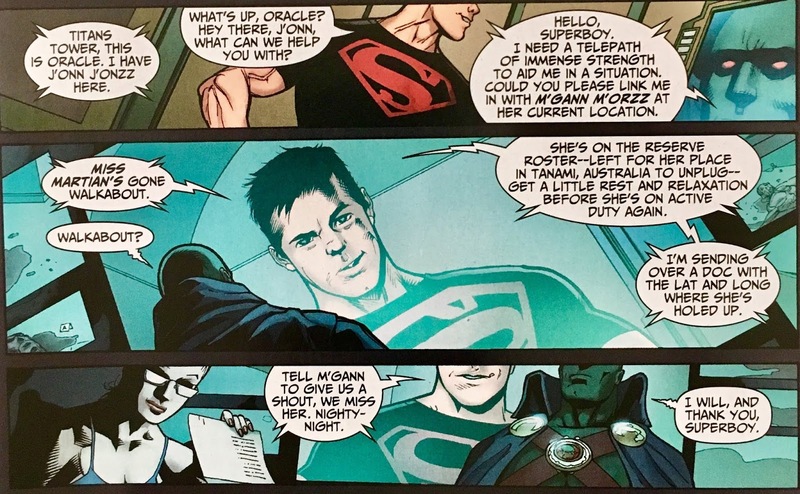 Superboy answers the call... and J'onn asks to speak with M'gann M'orzz... Miss Martian! Kon tells him she ain't around... and to check her little dwelling in Tanami, Australia. Which is exactly where we end this outing... and it looks like M'gann ain't having the best walkabout. Feels like things are going to get rolling here... but, it's starting to feel like... ya know when you "miss" a sneeze? Like, you're expecting it... you feel it coming on... you might even stare into a bright light to prompt it, then... nothing. It's kinda like when you're listening to Journey's "Don't Stop Believing"... and you feel like nearly every single line should be followed up with Steve Whatshisface belting out the chorus... then he doesn't! That's Brightest Day to me. Every time it feels like we're getting somewhere... the sneeze gets stifled. Let's talk up some good points here. Even though the scene at the gravesite felt a bit "off", I do appreciate the fact that Deadman has to relearn what it means to... ya know, not be dead. His stomach rumbles... and he has to be reminded by the Ring to eat something. I dig that... even if we took a roundabout way of getting there. 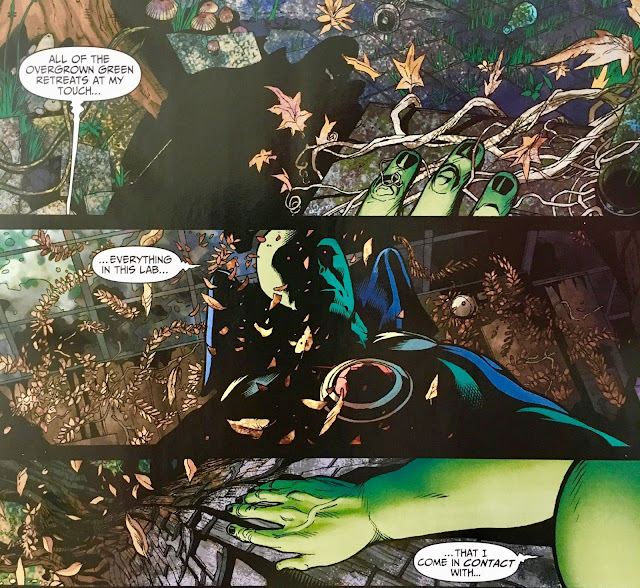 J'onn's walkabout was pretty neat, and is the first time we get the impression that Brightest Day and the Parliament of Trees might be crossing paths before all is said and done. I can't remember if I picked up on these clues my first time through... but this time around, it's definitely telegraphed. 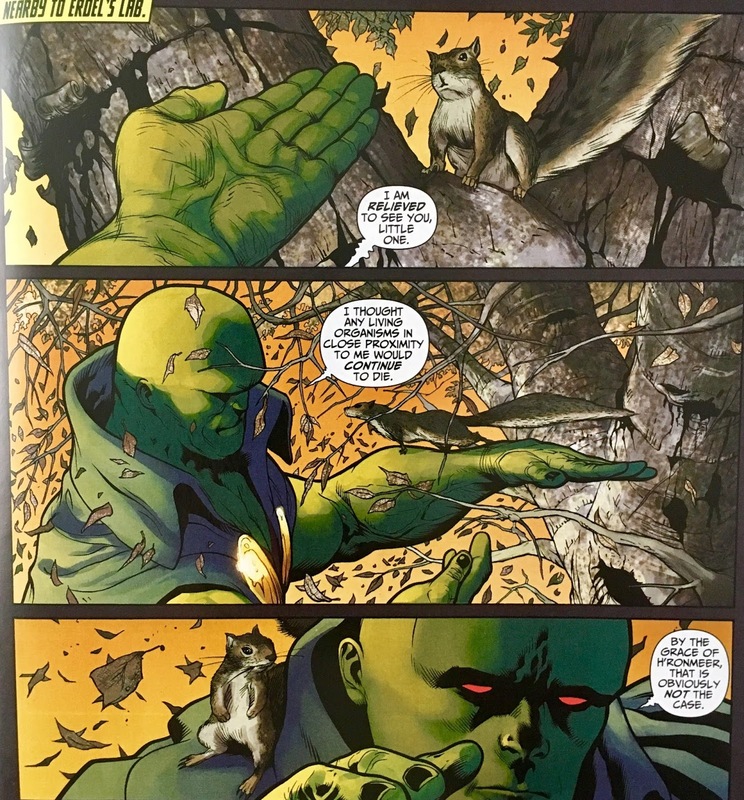 If you don't know what I'm alluding to... notice that J'onn's touch is killing things associated with "The Green" (plants and whatnot), but not "The Red" (the squirrel). That was pretty cool... but, I still can't shake the feeling that we're wasting too many pages. From here, we get a page of J'onn checking in at "The Still Zone"... then for a multi-page chat with Oracle which amounts to... J'onn just remembering something on his own. Oh well... I guess it's always cool to see Oracle. 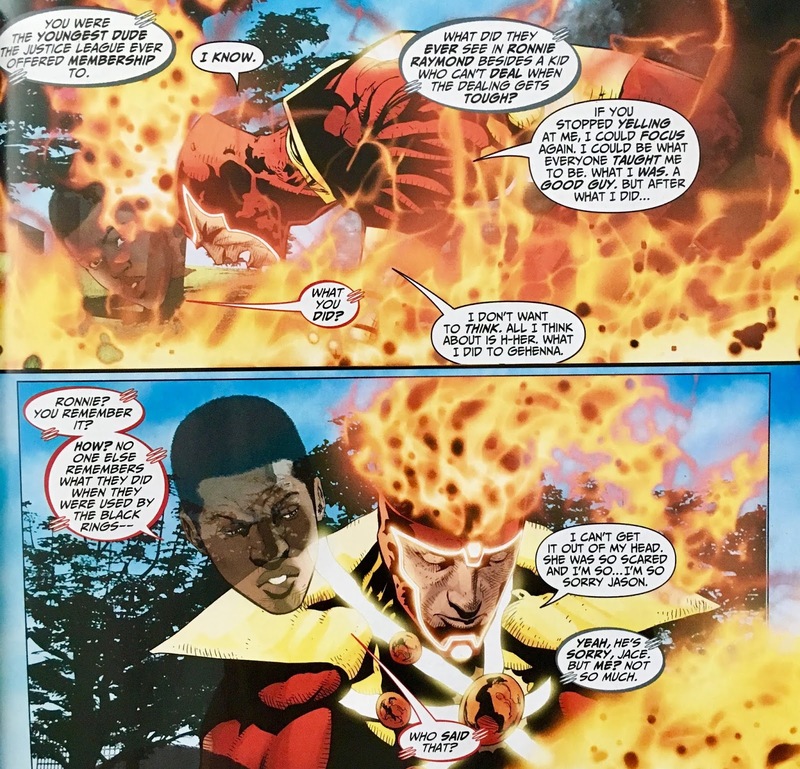 The Firestorm scene confused me a bit because... didn't we just spend a couple of issues prying Ronnie and Jason apart? Seems kinda soon to bring 'em back together, also a little anticlimactic... but, what do I know? 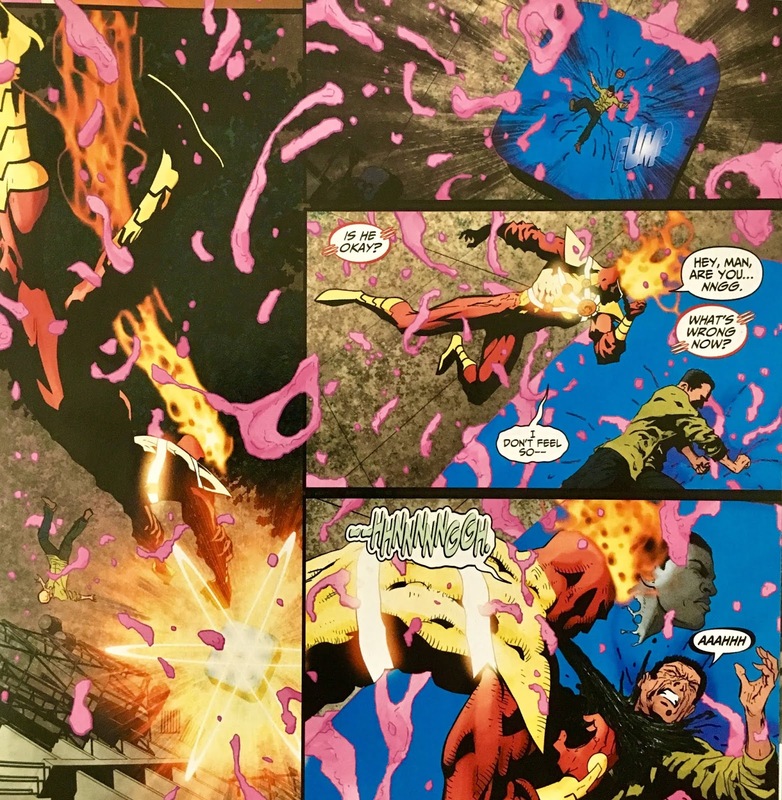 The requisite Didio-DC gore is here in spades. 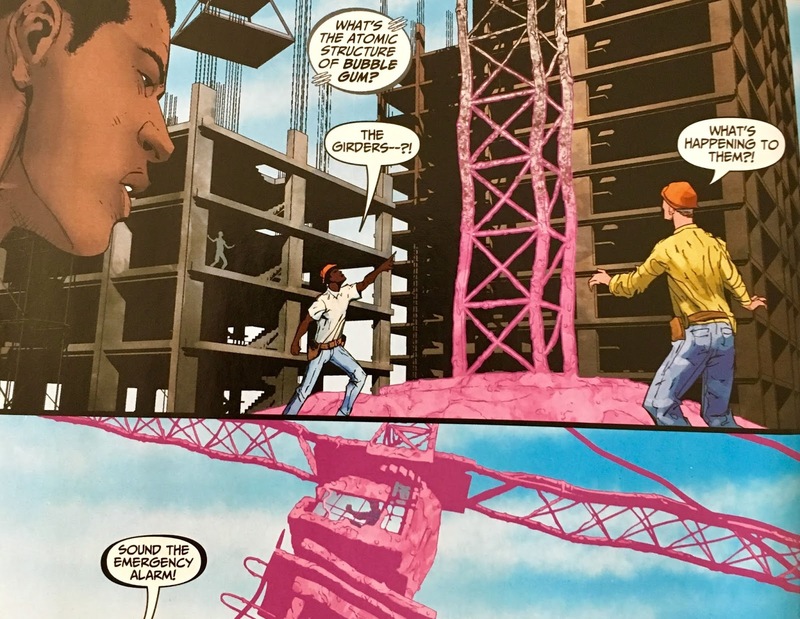 I mean, when we have a graphic decapitation on page 1... you'd assume that we can only go "up" from there. 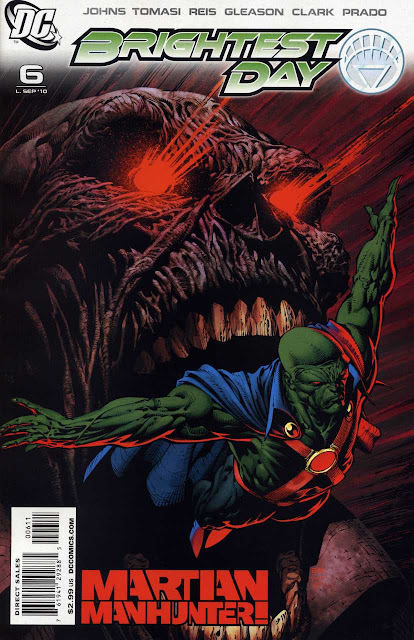 That's not the case though... because on the last page we get a look at a bloody and beaten Miss Martian. 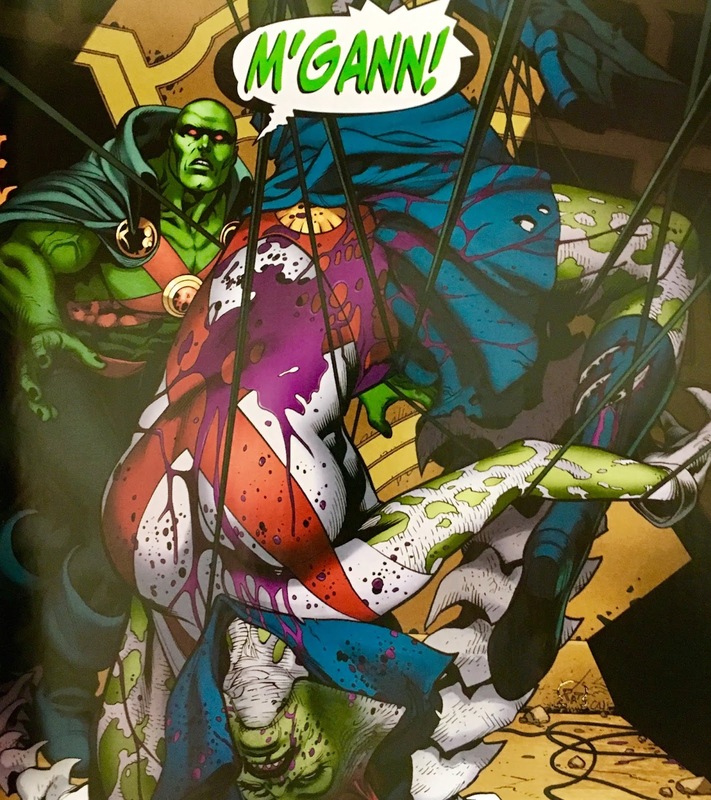 I dunno what it is, but it doesn't feel like such brutality should be used with M'gann. 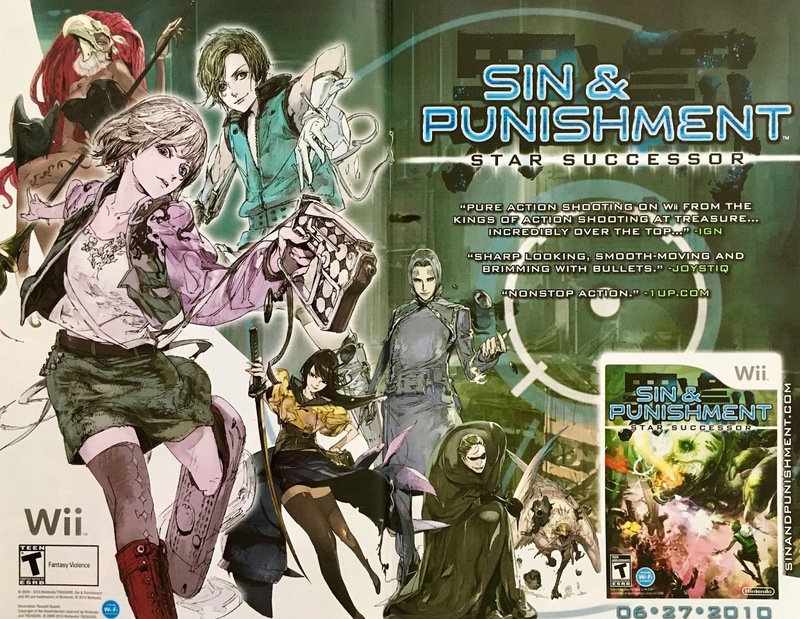 Just doesn't feel right... which is probably exactly why they did it. Overall... ehh. Read it in trade.